Forward markets have been in a state of backwardation for quite some time, creating strength in prompt month pricing. Backwardation means that prices in the future are lower than prices today; it contrasts with contango, when markets are steadily rising in the future. For our newer readers, let’s take a quick step back and explain where forward markets come from. While we talk about the price of today’s fuel often, the NYMEX price that we give is actually a futures contract. The crude, diesel, and gasoline prices you see in the top right Commodities Corner are looking towards November prices (called “prompt month” prices). When you plot each month’s futures price (there’s a price associated with each month, extending years into the future), you have the market’s forward curve, or where markets expect prices to be in the future. Why Are Futures Prices Useful? The forward curve is one of the best ways to inform your future price expectations – not because it’s accurate (the curve changes every single day, often without an apparent cause), but because it’s the best information the market can offer today. More importantly, you can use the forward curve to lock in your prices for the next year, allowing you to have fuel budget certainty. Because markets can move dramatically minute-to-minute, it’s important to capitalize on beneficial curve dynamics (such as backwardation) when they appear, and not rely on prices to fall lower. While you can get lucky, trying to time the market is just gambling by another name. A great example of forward curves being wrong is diesel prices in 2016 compared to today. One year ago, markets expected the price of fuel today to be below $1.70, while prices are now five cents above that level. 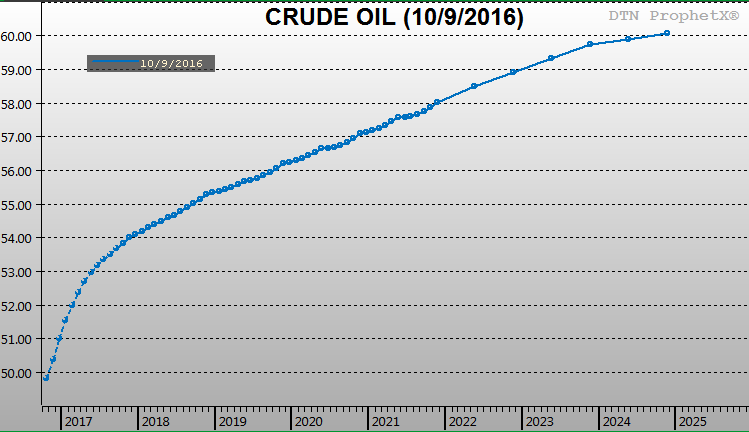 Had a company locked in the supply curve in 2016, they’d be paying a lower price for fuel today, even though markets are backwardated. Similarly, even though the forward curve currently shows prices falling in the future, they could easily flip and rise higher as markets continue to tighten, meaning consumers will pay higher prices later on. How Do Futures Prices Affect Markets? Forward prices can have a significant impact on market fundamentals. Suppliers often buy fuel now and pay for storage as they wait for the price to rise; currently, they have no incentive to put fuel in storage, so they’re drawing it out of storage to capitalize on today’s higher prices. This dynamic has been the driver of storage draws over the past few months. The forward curve also informs producers on how much fuel to produce in the future. A declining curve tells producers to cut back on production in expectation of lower prices, which reduces supply. That in turn pushes prices higher in the short-term, leading to higher prices for consumers. A forward curve hovering near $50 means that U.S. producers can lock in production revenue and ensure profitability into the future, but likely will not bring much new production online, keeping production levels flat. Having an idea of where prices will go is useful, but just knowing a general market direction isn’t practical. The real value of futures markets is that you can lock in your future prices, taking control of your fuel budget for the next fiscal year. Markets are volatile – backwardation today can flip to contango tomorrow, and one announcement from OPEC could send prices significantly higher. Another consideration is basis movements – while overall markets may be moving lower, local prices (prices in Florida during the recent hurricane, for instance) can surge upwards. Locking in a NYMEX price is partial protection, but full protection requires covering your entire fuel price exposure. For more information on locking in your total fuel price, contact Jay Blanton, Mansfield’s hedging expert, at jblanton@mansfieldoil.com. He can help you identify a price protection plan that fits your company’s unique energy needs.